Networks are expanding exponentially, and manual device discovery and mapping is becoming increasingly impossible. With technologies like virtualization, remote access, mobile and cloud computing dynamically altering networks, an automated layer 2/3 Discovery tool holds the key to network device discovery and mapping difficulties. 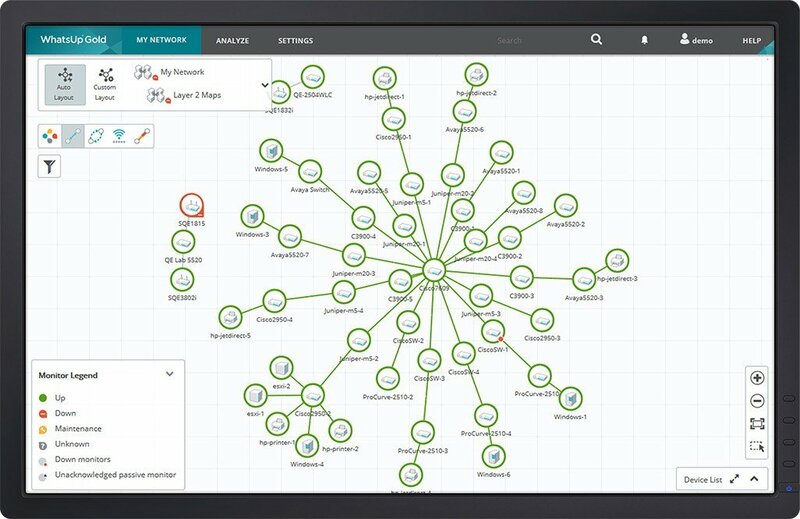 By discovering and mapping your networks in real-time, a layer 2/3 discovery tool ensures your knowledge of network topology, device attributes and changes remain up-to-date. Tools like WhatsUp Gold function across both Layer 2 and Layer 3 to create dynamic topological maps of your network. Layer 3 discovery techniques include: SNMP-based discovery (where SNMP-enabled devices exchange device information); Active probes approach (where target probe executables are sent out to query the network), and route analytics (using protocols like EIRGP and OSPF). While Layer 3 discovery lets administrators visualize the network, a drilled-down view of the network can be obtained through Link Layer Discovery, which shows the interconnections in each switch, down to individual port connections, subnet, spanning tree information and VLAN details. Layer 2 discovery protocols, including the proprietary CDP, and JDP, and the vendor-neutral LLDP, automatically discover, deploy and monitor switches, hubs, bridge ports and VLANs. Problem detection and root cause analytics now become infinitely easier – Layer 3 discovery locates and identifies the malfunctioning network device, while Layer 2 details show the switch port/ interface the problem has originated from. WhatsUp Gold automatically builds integrated Layer 2 and Layer 3 maps, using a wide range of techniques including SNMP Smart Scan, IP Address Range Scans, single device scans, host file import (Layer 3) and ARP Cache Discovery/ Ping Sweep methods (Layer 2). By correlating Layer 3 discoveries with Layer 2 details, this Layer 2/3 discovery tool offers a complete and granular view of the network.